Chronic cerebral ischemia is the leading cause of adult disability from Alzheimer's disease and vascular dementia, which are accepted as the most common forms of dementia., In recent years, oxidative stress has been shown to play an important role in ischemic brain injury. The ischemic areas show activation of free-radical processes and the generation of reactive oxygen species, leading to lipid peroxidation, which eventually causes cell injury. Superoxide dismutase (SOD) and catalase (CAT) are known to effectively remove oxygen free radicals and peroxides through chronic cerebral ischemic injury. Numerous antioxidants, such as ginkgo and oxiracetam, have shown neuroprotective effects in ischemia cerebral injury with satisfactory clinical results., Shunaoxin pills (SNX) are composed of Chuanxiong Rhizoma, which contains the roots of Ligusticum chuanxiong Hort. and Angelica sinensis Radix as well as the root of A. sinensis (Oliv.) Diels, which are treatments from traditional Chinese medicine (TCM) that are known to improve cerebral microcirculation and oxygen delivery as well as reinforce learning and memory., A clinical study showed that SNX had an obvious preventative effect against ischemic stroke. However, the mechanism and effect of the constituents of SNX are not clear. Chuanxiong Rhizoma and Angelica have been found to contain many active components, such as Z-ligustilide, ligustrazine, and ferulic acid, which have significant antioxidant pharmacological activities.,, Nevertheless, it is not clear which ingredients in SNX have some comprehensive beneficial effects. As is known to all, the quality of TCM forms the foundation of its clinical efficacy. How to effectively control TCM quality remains a challenge. In 2016, a novel concept of the TCM quality marker (Q-marker) was proposed by Academician Liu. Focusing on the concept, Chinese scholars have been conducting Q-marker research about its discovery and application and gradually formed a new quality research model., In this article, we propose a new research strategy, which integrated network pharmacology and activity-guided screen system to exploring Q-markers in SNX. After evaluating the protective effect of SNX in the rat model of chronic cerebral ischemia, the main chemical components in SNX were identified by ultra-performance liquid chromatography-quadrupole time-of-flight (UPLC/Q-TOF). Then, their potential targets focused on oxidative stress pathways were determined through network pharmacology methods. At the same time, the antioxidants in SNX were screened by a novel high-performance liquid chromatography (HPLC) postcolumn derivatization system and then the key ingredients were recommended as Q-markers and verified through an oxidative damage model in endothelial cell level. About 100 mg of SNX extract (Tianjin Zhongxin Pharmaceutical Group Co., Ltd., Tianjin, China) and 1 mg of ferulic acid and ligustilide (Tianjin YIFANG S and T Co., Ltd., Tianjin, China) were dissolved in 10 mL of methanol for UPLC analysis. Nicergoline tablets (Kunshan KRRP Pharmaceutical Co., Ltd., Jiangsu, China) and SNX were diluted with physiological saline for animal experiments. Sprague-Dawley (SD) male rats, which weighed 250–300 g, were purchased from the Beijing Experimental Animal Center of Military Medical Sciences (Beijing, China). The animals were raised in a 12 h automatic light/dark cycle in a standard animal room with the temperature maintained at 23°C–26°C. Rats had free access to water and food until the day of the operation. A chronic cerebral ischemia model was established by ligating the bilateral common carotid artery. After the procedure was finished, rats were treated with normal saline, nicergoline, or different doses of SNX once a day for 2 months using oral gavage. Thirty minutes after the last treatment, the brain tissues were collected and divided into two parts. Half of the samples were preserved in formalin for HE staining, and the other half were used to detect the SOD and CAT contents with ELISA kits (Xitang Company, Shanghai, China). The sample was passed through a 0.22 μm microporous membrane and analyzed by an UPLC/Q-TOF system. A Waters Acquity UPLC System (Waters Co., Milford, America) was equipped with a photodiode array detector, which achieved in a range of 190–400 nm. The system was controlled using Mass Lynx V4.1 software (Waters Co.). An Acquity BEH C18 column (2.1 × 100 mm, 1.7 μm; Waters Co.) was used for the separations. The injection volume was 2.0 μL with a gradient elution of acetonitrile (A) and a 0.1% formic acid aqueous solution (B) using the following protocol: 2% to 27% A at 0–8 min, 27% to 35% A at 8–15 min, 35% to 50% A at 15–20 min, 50% to 65% A at 20–27 min, 65% to 73% A at 27–32 min, 73% to 100% A at 32–35 min, and 100% to 2% A at 35–38 min, and then, the system was maintained at 2% A from 38 to 40 min. The flow rate was 0.40 mL/min, and the column temperature was maintained at 30°C. Tandem mass spectrometry (MS/MS) was performed on a Waters UPLC/Q-TOF Premier with an electrospray ionization (ESI) system (Waters MS Technologies, Manchester, UK). The ESI-MS spectra were acquired in both the negative and positive ion voltage modes. The ion source temperature was 110°C. The capillary voltage was set to 2.5 kV for the negative mode and 3.0 kV for the positive mode. The sample cone voltage was set to 30 V. High-purity nitrogen was used as the nebulization agent in the negative mode and auxiliary gases were used in the positive mode. The nitrogen gas flow rate was 600 L/h and temperature was 350°C, and the cone gas was set to 50 L/h. The acquisition rate was 0.1 s with a 0.02 s interscan delay. The mass detection range was 100–1500 Da. Leucine enkephalinamide acetate (200 μg/L) was used as the lock mass ([M − H] − =553.2775, [M + H] + =555.2931). Using Lipinski's rule of five and topological polar surface area (TPSA) (http://www.molinspiration.com/cgi-bin/properties), the absorbability of the compounds identified in SNX was calculated. The compounds that met the rules and had TPSAs ≤140 as well as rotatable bonds ≤10 were deemed to be good orally absorbable compounds. The compounds that met both criteria were considered to be orally available compounds. Next, the three-dimensional structures of the identified compounds that were absorbed by the body were entered into the PharmMapper database (http://59.78.96.61/phammapper) for target prediction. The pathways were determined through KEGG pathway analysis (http://bioinfo.capitalbio.com). Protein interactions were analyzed using String 10.5 (http://www.string-db. org/). All analyses were carried out on a liquid chromatography system (LC-20AD, Shimadzu, Japan) equipped with ultraviolet (UV) (SPD-20A, Shimadzu, Japan) and fluorescence (FLD) (RF-20A, Shimadzu, Japan) detectors. The measurements were conducted with two solvent delivery pumps (LC-20 AT, Shimadzu, Japan) and two derivatization solvent delivery pumps (LC-10 AT, Shimadzu, Japan). Separation was achieved on a water symmetry C18 column (250 mm × 4.6 mm i.d., 5 μm, Phenomenex, California, USA). The injection volume was 20 μL and a gradient elution of a 0.1% formic acid aqueous solution (A) and acetonitrile (B) was performed as follows: 5% to 27% B at 0–15 min, 27% to 33% B at 15–30 min, 33% to 54% B at 30–40 min, 54% to 69% B at 40–50 min, 69% to 71% B at 50–55 min, 71% to 80% B at 55–65 min, 80% to 85% B at 65–70 min, 85% to 90% B at 70–75 min, 90% to 100% B at 75–80 min, and 100% to 5% B at 80–85 min, and then, the system was maintained at 5% B from 85 to 90 min. The flow rate was set at 1 mL/min, and the column temperature was maintained at 35°C in a column oven (CTO-10AS, Scienhome, Tianjin, China). The separated compounds were first detected at 260 nm using a UV detector and then used in the following derivation process. The postcolumn derivatization was based on a simultaneous supply of a 3% H2O2 solution and derivatization reagent that contained 8 × 10−6 mol/L hemin (Meryer Chemical Technology Co., Ltd., Shanghai, China) and 8 × 10−5 mol/L 4-hydroxyphenylacetic acid (PHPAA) (Macklin Biochemical Technology Co., Ltd., Shanghai, China) dissolved in an NH4 Cl/NH3.H2O buffer solution (pH 10.5). The flow rates were set at 0.6 mL/min and 0.2 mL/min. The derivatization reaction was maintained throughout the length of a polyether ether ketone tube (0.18 mm × 3 m) at 25°C. Moreover, the elution was detected by FLD detector, the excitation wavelength was 315 nm, and the emission wavelength was 400 nm. Mouse brain cerebral cortex cell line, B End. 3 cells (American Type Culture Collection, USA) were cultured in Dulbecco minimum essential medium (DMEM, Gibco, USA) supplemented with 10% fetal bovine serum (FBS, Gibco, USA), 100 U/mL penicillin, and 0.1 mg/mL streptomycin (Gibco, USA) in a 37°C humidified incubator with a 5% CO2 supply. After the cells reached 80%–90% confluence, they were stimulated with 100 μmol/L H2O2 for 30 min, except for cells in the control group. Next, the cells were treated with ferulic acid, ligustilide (Tianjin YIFANG S and T, Tianjin, China), and Vitamin C (Bayer, Germany) for 6 h, and then, the contents of nitric oxide (NO) and activities of NO synthase (NOS), malonaldehyde (MDA), and SOD were detected according to the kit instructions (Nanjing Jiancheng Bio, Shanghai, China). All data are expressed as the means ± standard deviation, statistical comparisons were conducted among groups with the t-test. All statistical analyses were performed using SPSS version 18.0 statistical analysis software (SPSS, Inc., Chicago USA). Statistical significance was set at P < 0.05. Usually, white matter occupies approximately 50% of the area in the brain tissue and is associated with intelligence activities, such as memory, behavior, and emotions, with fibers traveling through the peripheral edges around the ventricles., When white matter is damaged by oxidation, the fiber connections through a site are interrupted, resulting in varying degrees of cognitive impairment. As shown in [Figure 1], in control group brain tissues, the number and morphology of nerve cells were normal, and there was no ischemia or necrosis. The model group showed that the brain tissue was sparser, neuronal perikarya exhibited the characteristic morphological features of ischemic damage in the parietal cortex, and subcortical tissue appeared to be loose and showed signs of edema. However, for the positive group with nicergoline (Positive, 2 mg/kg) and for the SNX treatment groups (SNX[H], 20 mg/kg, SNX[M], 10 mg/kg, SNX[L], 5 mg/kg), the nerve cells were arrayed normally along the axon and the white matter was not loose in the corpus callosum or in the subcortical and cerebral ventricles. This outcome suggested that SNX improved the ischemic injury after the operation. To further determine the benefits of SNX, we evaluated the activities of SOD and CAT, which are two important antioxidant indices in rat serum of rats. As shown in [Figure 2], the chronic cerebral ischemia model resulted in a significant decrease in CAT and SOD activities compared to the control group (P < 0.001, P < 0.05). The SNX high-dose treatment markedly reduced these changes in chronic cerebral ischemia as well as increased the CAT and SOD levels (P < 0.01, P < 0.05). It was reported that chronic cerebral ischemia due to a large amount of oxygen free radicals consumes excessive CAT and SOD, resulting in reduced CAT and SOD levels in brain tissue as well as causing damage to the structure and function of the brain biofilm., The results indicated that SNX may play an important role through antioxidant effects. To profile the holistic compounds in SNX, UPLC/Q-TOF assay was carried out. Detailed results about separation and identification of MS/MS information were shown in [Figure 3] and [Table 1]. Overall, 18 main chemical constituents from SNX were identified and mainly classified into five chemical structure types, including lactones (diligustilide, 4-OH-3-butylphthalide, cnidilide, senkyunolide I, ligustilide, neoligustilide, bergapten, and phthalic anhydride), phenolic acids (vanillic acid, protocatechuic acid, ferulic acid, caffeic acid, guaiacol, isoeugenol, and anisic acid), alkaloids (ligustrazine), terpenes (spathulenol), and anthraquinones (chrysophanol). However, some of these components may not be absorbed in the human body, so we calculated the absorption properties of these components. As shown in [Table 1], 17 components were proposed to be matched Lipinski's rule of five. Using virtual calculations in PharmMapper, 17 ingredients that have absorption properties were predicted to regulate a total of 47 targets (PTGS2, PRKACA, PTGS1, CDK2, CCNA2, ESR2, ESR1, CA1, HBA2, CA2, OPRM1, OPRK1, PDE4D, OPRD1, SCN5A, PGR, HSD17B1, AR, GLTP, LCN2, ACHE, NR3C2, ADRB2, ADRB1, PRSS1, POLK, ADRA2A, HTR2A, DRD2, DRD1, NCOA1, CHRM1, NOS2, PLA2G1B, ADRA1A, PDE4B, CA4, NOS3, IFNG, GABBR1, ABCC8, GABRA1, GABRA5, HRH1, ADRA2B, DHFRP1, and TUBA1A). As shown in [Table 1], we analyzed the 15 main components of SNX, which regulate ten oxidative stress-related targets with a norm fit value ≥0.3 by annotation. These targets were part of cGMP-PKG signaling pathway, arachidonic acid metabolism, and nitrogen metabolism signaling pathways chiefly. 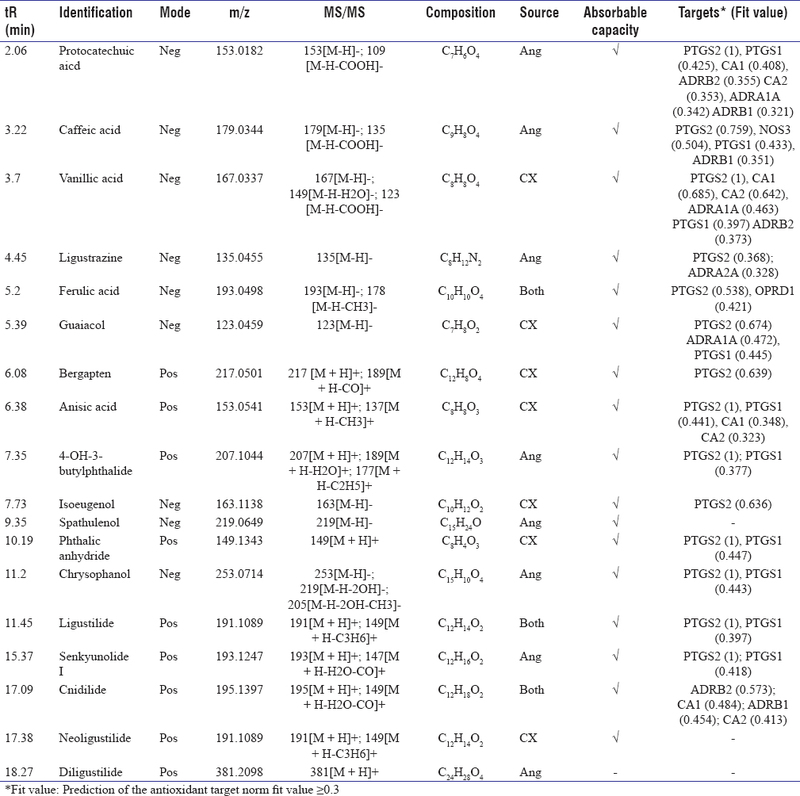 As shown in [Figure 4], cnidilide, anisic acid, vanillic acid, and protocatechuic acid may be regulated nitrogen metabolism by modulating CA1 and CA2; isoeugenol, guaiacol, protocatechuic acid, vanillic acid, chrysophanol, ligustilide, anisic acid, cnidilide, bergapten, caffeic acid, phthalic anhydride, senkyunolide I, 4-OH-3-butylphthalein, ferulic acid, and ligustrazine could be related to arachidonic acid metabolism by modulating PTGS1 and PTGS2; and protocatechuic acid, guaiacol, vanillic acid, caffeic acid, anisic acid, ligustrazine, cnidilide, and ferulic acid were predicted to regulate the cGMP-PKG signaling pathway by modulating ADRA1A, ADRA2A, ADRB1, ADRB2, OPRD1, and NOS3. The studies on Rhizoma Chuanxiong and Angelica have reported that essential oils could inhibit the production of free radical by 2,2-diphenyl-1-picrylhydrazyl (DPPH) and 2,2'-azinobis-(3-ethylbenzthiazoline-6-sulphonate) ABTS detections, and that alkaloids could scavenge DPPH, nitric oxide (NO), lipid peroxidation and superoxides in the treatment of Alzheimer's diseas. In addition, ferulic acid and similar phenolic compounds greatly reduce free-radical damage in neuronal cell systems without causing cell death. It has been reported that oxidative stress impairs the ability of NO to increase cGMP and the ability of cGMP to activate its specific kinase PKG by reducing the synthesis of SOD. Antioxidants have also been reported to take part in the regulation of guanylate cyclase and stabilization of NO as well as to increase the levels of cGMP by stimulating guanylate cyclase. Arachidonic acid effectively improves SOD and CAT activities in hippocampal tissue as well as its neuroprotective effects against oxidative stress injury induced by glutamate or H2O2. However, there are few studies on the mechanisms of nitrogen metabolism in the human body. 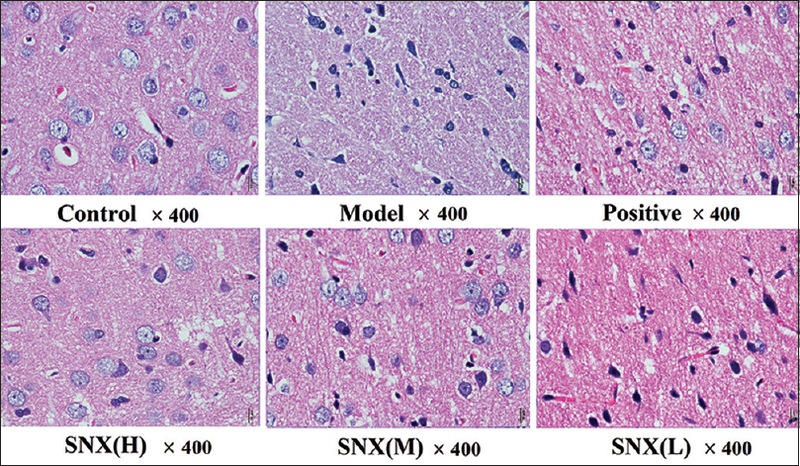 All of these results suggest that SNX plays a role in protecting the brain against chronic cerebral ischemia injury through antioxidant pathways. However, the precise ingredients, targets, and mechanisms were not clear. Antioxidants can directly react with lipid chain oxidation intermediates, lipid free radicals, or oxygen free radicals to terminate the chain reaction and remove free radicals by inhibiting lipid oxidation. Antioxidants can also affect oxidases in organisms, such as NOS, to inhibit the production of free radicals. In vivo, antioxidant enzymes can clear free radicals, which have important physiological functions and antioxidants can enhance the activity of antioxidant enzymes. In addition to the biological antioxidant processes, there is another way to eliminate H2O2 directly through phenolic hydroxyl as antioxidants react with free radicals. 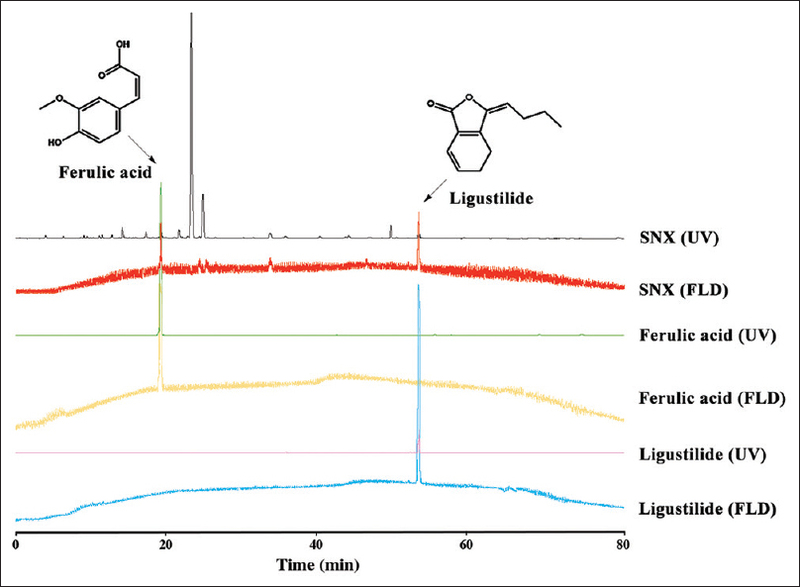 To evaluate the chemical antioxidant activity of SNX components in vitro, the postcolumn-derived HPLC-UV-FLD system was established to detect the reactive oxygen radical scavenging ability based on PHPAA chemiluminescence. PHPAA can react with H2O2 and be converted into 2,2'-dihydroxydiphenyl-5,5'-iminodiacetic acid, which has fluorescent characteristics. As shown in [Figure 5], we found that two strong antioxidants from SNX, ligustilide and ferulic acid, reacted with H2O2 to remove oxygen free radicals significantly. It has been reported that ferulic acid and ligustilide can pass through the blood–brain barrier into the cerebrospinal fluid., The result indicated that ligustilide and ferulic acid may be the core antioxidants in SNX. The common markers of oxidative stress in the body include NO and MDA. NOS, which can produce superoxides, was shown to be expressed in neurons and postsynaptic sites of excitatory synapses. Previous results demonstrated that the active ingredients could produce an antioxidant effect by reducing the content of MDA, increasing the activities of NO, NOS, and SOD. Hence, we analyzed the benefit of main antioxidants, ferulic acid and ligustilide in the biological processes. 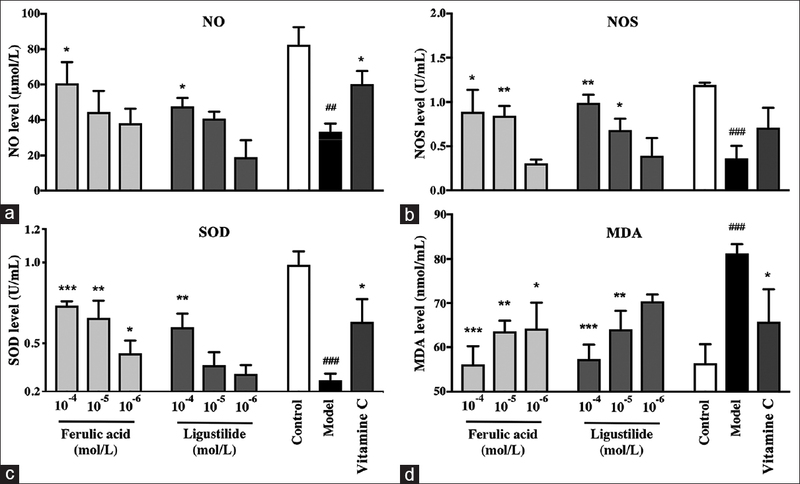 As shown in [Figure 6], ferulic acid and ligustilide significantly reduced the content of MDA as well as increased the activities of NO, NOS, and SOD in a dose-dependent manner, consistent with the predicted results. As a result, ferulic acid and ligustilide not only as a chemical antioxidant, but also have the potential of biological antioxidant activity through arachidonic acid metabolism and the cGMP-PKG signaling pathway by targeting PTGS1, PTGS2, and OPRD1 multitargets. Hence, ferulic acid and ligustilide can be recommended as the Q-marker for quality control. The intrinsic multicomponent and multitarget feature of TCM is different from the Western medicine. However, TCM is investigated essentially as herbal medicine or natural product, and the quality control are actually chemical markers based, it has deviated from the basic TCM theory. In this study, chemical and biological methods were integrated to rapidly discover key components related to TCM efficacy. This approach provides a new means for the discovery of Q-markers. In this study, we explored the beneficial effects of SNX for protecting cerebral tissue and speculated that the protective effects in the brain were related to three main antioxidant pathways regulated by 15 components through 10 potential targets by network pharmacology. Integrated with a chemical antioxidant evolution system and cell-level oxidative stress test, we proposed that ferulic acid and ligustilide are major active ingredients as Q-markers that can be used to control the quality of SNX for treatment chronic cerebral ischemia. This work was supported by a grant from the National Natural Science Foundation of China (No. 81673637, 81473403, 81673616 and 81430095). Zhang Q, Gao T, Luo Y, Chen X, Gao G, Gao X, et al. Transient focal cerebral ischemia/reperfusion induces early and chronic axonal changes in rats: Its importance for the risk of Alzheimer's disease. PLoS One 2012;7:e33722. Ye Y, Huang C, Jiang L, Shen X, Zhu S, Rao Y, et al. Huanglian-jie-du-tang extract protects against chronic brain injury after focal cerebral ischemia via hypoxia-inducible-factor-1α-regulated vascular endothelial growth factor signaling in mice. Biol Pharm Bull 2012;35:355-61. Azizova OA, Solov'Eva EY, Aseichev AV, Baranova OA, Bekman EM, Karneev AN, et al. Interaction of oxidative stress and the clinical course of chronic cerebral ischemia. Neurosci Behav Physiol 2015;45:36-41. Lee JH, Park SY, Shin HK, Kim CD, Lee WS, Hong KW, et al. Protective effects of cilostazol against transient focal cerebral ischemia and chronic cerebral hypoperfusion injury. CNS Neurosci Ther 2008;14:143-52. Peng C, Xie X, Wang L, Guo L, Hu T. Pharmacodynamic action and mechanism of volatile oil from rhizoma Ligustici chuanxiong hort. On treating headache. Phytomedicine 2009;16:25-34. Meng H, Guo J, Sun JY, Pei JM, Wang YM, Zhu MZ, et al. 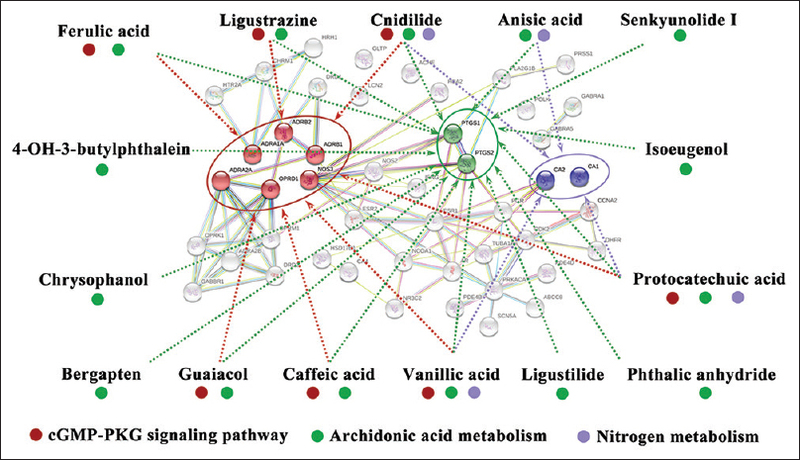 Angiogenic effects of the extracts from Chinese herbs: Angelica and chuanxiong. Am J Chin Med 2008;36:541-54. Yan XJ, Yuan-Hong JI, Yu-Ping MA, Xiao-Hua LI. Clinical observation of shunaoxin dropping pills in the adjuvant treatment of patients with ischemic stroke. China Pharm 2015;12:1629-31. Kanski J, Aksenova M, Stoyanova A, Butterfield DA. Ferulic acid antioxidant protection against hydroxyl and peroxyl radical oxidation in synaptosomal and neuronal cell culture systems in vitro: Structure-activity studies. J Nutr Biochem 2002;13:273-81. Kuang X, Yao Y, Du JR, Liu YX, Wang CY, Qian ZM, et al. Neuroprotective role of Z-ligustilide against forebrain ischemic injury in ICR mice. Brain Res 2006;1102:145-53. Xu Z. Protective effect of ligustrazine on cerbral ischemia-reperfusion injury of rats. J Pract Tradit Chin Med 2007;7:411-13. Yu G, Liu L, Zhang P, Li Y. Protective effect of curcumin on chronic cerebral ischemia by altering expression of α – Synuclein in 2VO model. Mol Neurodegener 2012;7 (Supp 1):1-1. Rost NS, Fitzpatrick K, Biffi A, Kanakis A, Devan W, Anderson CD, et al. White matter hyperintensity burden and susceptibility to cerebral ischemia. Stroke 2010;41:2807-11. Liu C, Chen S, Xiao X, Zhang T, Hou W, Liao M. A new concept on quality marker of Chinese material medica: Quality control for Chinese medicinal products. Chin Tradit Herb Drugs 2016;47:1443-57. Liu C, Cheng Y, Guo D, Zhang T, Li Y, Hou W, et al. A new concept on quality marker for quality assessment and process control of Chinese medicines. Chin Herb Med 2017;9:3-13. Ding G, Wang Y, Liu A, Hou Y, Zhang T, Bai G, et al. 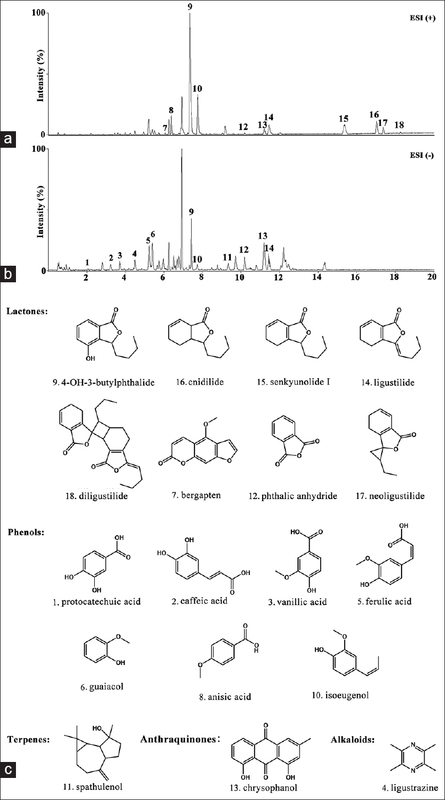 From chemical markers to quality markers: An integrated approach of UPLC/Q-TOF, NIRS, and chemometrics for the quality assessment of honeysuckle buds. RSC Adv 2017;7:22034-44. Wang JY, Xia Q, Chu KT, Pan J, Sun LN, Zeng B, et al. Severe global cerebral ischemia-induced programmed necrosis of hippocampal CA1 neurons in rat is prevented by 3-methyladenine: A widely used inhibitor of autophagy. J Neuropathol Exp Neurol 2011;70:314-22. Sekhon LH, Morgan MK, Spence I, Weber NC. Chronic cerebral hypoperfusion and impaired neuronal function in rats. Stroke 1994;25:1022-7. Bandeira Sde M, Guedes Gda S, da Fonseca LJ, Pires AS, Gelain DP, Moreira JC, et al. Characterization of blood oxidative stress in type 2 diabetes mellitus patients: Increase in lipid peroxidation and SOD activity. Oxid Med Cell Longev 2012;2012:819310. Wang G, Liu X, Guo Q, Namura S. Chronic treatment with fibrates elevates superoxide dismutase in adult mouse brain microvessels. Brain Res 2010;1359:247-55. Jeong JB, Ju SY, Park JH, Lee JR, Yun KW, Kwon ST, et al. Antioxidant activity in essential oils of Cnidium officinale makino and Ligusticum chuanxiong hort and their inhibitory effects on DNA damage and apoptosis induced by ultraviolet B in mammalian cell. Cancer Epidemiol 2009;33:41-6. Xiong L, Fang ZY, Tao XN, Bai M, Feng G. Effect and mechanism of ligustrazine on th1/Th2 cytokines in a rat asthma model. Am J Chin Med 2007;35:1011-20. Doronzo G, Viretto M, Russo I, Mattiello L, Di Martino L, Cavalot F, et al. Nitric oxide activates PI3-K and MAPK signalling pathways in human and rat vascular smooth muscle cells: Influence of insulin resistance and oxidative stress. Atherosclerosis 2011;216:44-53. Ota KT, Pierre VJ, Ploski JE, Queen K, Schafe GE. The NO-cGMP-PKG signaling pathway regulates synaptic plasticity and fear memory consolidation in the lateral amygdala via activation of ERK/MAP kinase. Learn Mem 2008;15:792-805. Wang ZJ, Liang CL, Li GM, Yu CY, Yin M. Neuroprotective effects of arachidonic acid against oxidative stress on rat hippocampal slices. Chem Biol Interact 2006;163:207-17. Wu K, Wang ZZ, Liu D, Qi XR. Pharmacokinetics, brain distribution, release and blood-brain barrier transport of shunaoxin pills. J Ethnopharmacol 2014;151:1133-40. Tan F, Fu W, Cheng N, Meng DI, Gu Y. Ligustrazine reduces blood-brain barrier permeability in a rat model of focal cerebral ischemia and reperfusion. Exp Ther Med 2015;9:1757-62. Sjöström PJ, Turrigiano GG, Nelson SB. Multiple forms of long-term plasticity at unitary neocortical layer 5 synapses. Neuropharmacology 2007;52:176-84. Hwang TM, Oh BS, Yoon Y, Kwon M, Kang J. Continuous determination of hydrogen peroxide formed in advanced oxidation and electrochemical processes. Desalination Water Treat 2012;43:267-73. Chu G, Cheng D, Liu W, Wang X, Hou X, Hou Y, et al. Screening and evaluation of antioxidants from lees by micro-injector systems combined with a fluorescent probe, N -borylbenzyloxycarbonyl-3,7-dihydroxyphenoxazine, in living Drosophila. Chin Chem Lett 2018;10:1521-7. Hu PY, Liu D, Zheng Q, Wu Q, Tang Y, Yang M, et al. Elucidation of transport mechanism of paeoniflorin and the influence of ligustilide, senkyunolide I and senkyunolide A on paeoniflorin transport through mdck-mdr1 cells as blood-brain barrier in vitro model. Molecules 2016;21:300. Lindenmeier M, Burkon A, Somoza V. A novel method to measure both the reductive and the radical scavenging activity in a linoleic acid model system. Mol Nutr Food Res 2007;51:1441-6. Lü JM, Lin PH, Yao Q, Chen C. Chemical and molecular mechanisms of antioxidants: Experimental approaches and model systems. J Cell Mol Med 2010;14:840-60. Shih PH, Yeh CT, Yen GC. Anthocyanins induce the activation of phase II enzymes through the antioxidant response element pathway against oxidative stress-induced apoptosis. J Agric Food Chem 2007;55:9427-35. Yang W, Zhang Y, Wu W, Huang L, Guo D, Liu C, et al. Approaches to establish Q-markers for the quality standards of traditional Chinese medicines. Acta Pharm Sin B 2017;7:439-46.